clinical trials are enrolling now! Two new phase 3 geographic atrophy clinical trials are enrolling now! Why Evaluate APL-2 in GA? APL-2 targets C3, which is the central protein in the complement cascade, positioned at the point where all 3 of the major complement activation pathways come together.14 C3 serves as the master switch, essentially controlling all downstream effectors.8 Thus, APL-2 could effectively inhibit activity associated with all 3 complement activation pathways.9 APL-2 may therefore be more effective in a broad patient population than an agent that inhibits only 1 or 2 of those pathways. In What Ophthalmic Disorders Is APL-2 Being Studied? In What Ophthalmic Diseases is APL-2 Being Studied? In this study, a single 15 mg/0.1 mL dose of APL-2 will be injected as an intravitreal injection once a month or once every other month for 24 months. For qualified patients who do not live near the study locations, Apellis can help to cover some or all of the costs associated with travel, if needed. What Is Geographic Atrophy (GA)? What Is the Average Age of Patients Diagnosed With GA? The early signs of AMD (drusen and pigmentary changes) are common in individuals over age 65 and precede the late stage forms. What Are the Causes of GA? Is GA a Hereditary Condition? What Are the Limitations to Current GA Treatment? So far, there is no approved treatment to prevent the onset and progression of GA.15 Several therapeutics are in various stages of clinical development. What Factors Indicate Complement Activation Plays a Role in GA? Reduced levels of complement inhibitors (eg, CD59, MCP) have been found in eyes with GA.
What Is the Potential Benefit of Complement Inhibitors for GA? Would DERBY or OAKS be considered an AMD trial? Both could broadly be referred to as a macular degeneration study or macular degeneration trial. However, it is more accurate to call them a geographic atrophy study, because they are studying a specific form of age-related macular degeneration. In fact, these trials are specifically studying people who have been diagnosed with geographic atrophy secondary to AMD. By targeting C3 at the point of convergence of all complement activation pathways, APL-2 can inhibit all 3 principal complement activation pathways.9 Thus, APL-2 may be more effective in a broad patient population than a partial inhibitor of complement would be. Opt-in to receive future communications and information about the clinical development of APL-2 in GA secondary to AMD. Facts about age-related macular degeneration. National Eye Institute Web site. 2018; https://nei.nih.gov/health/maculardegen/armd_facts. Accessed May 6, 2018. Age-related macular degeneration. National Eye Institute Web site. 2018; https://nei.nih.gov/health/maculardegen/. Accessed May 6, 2018. Age-related macular degeneration (AMD). 2018; https://nei.nih.gov/eyedata/amd. Accessed May 7, 2018. Sunness JS, Rubin GS, Applegate CA, et al. Visual function abnormalities and prognosis in eyes with age-related geographic atrophy of the macula and good visual acuity. Ophthalmology. 1997;104(10):1677-1691. Chakravarthy U, Bailey CC, Johnston RL, et al. Characterizing Disease Burden and Progression of Geographic Atrophy Secondary to Age-Related Macular Degeneration. Ophthalmology. 2018;125(6):842-849. Wang P, Cottrell GW. Central and peripheral vision for scene recognition: A neurocomputational modeling exploration. J Vis. 2017;17(4):9. Kolb H. Simple anatomy of the retina. Webvision Web site. 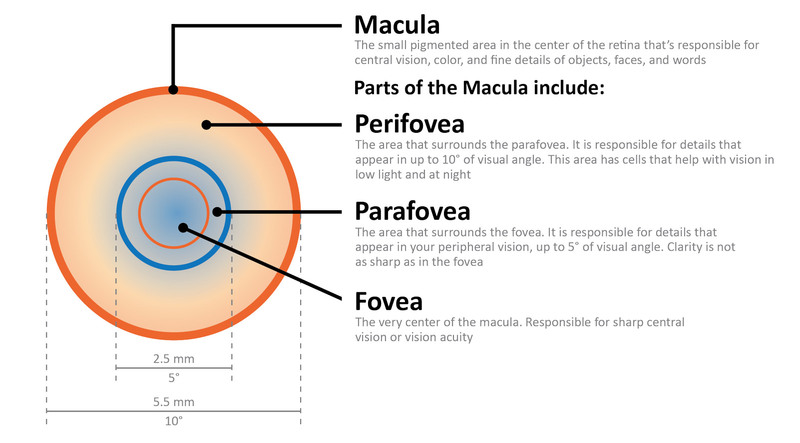 2018; https://webvision.med.utah.edu/book/part-i-foundations/simple-anatomy-of-the-retina/. Accessed July 30, 2018. Murphy K, Weaver C. Innate immunity: the first lines of defense. In: Janeway's Immunobiology. 9th ed. London, UK: Garland Science; 2016. Boyer DS, Schmidt-Erfurth U, van Lookeren Campagne M, et al. 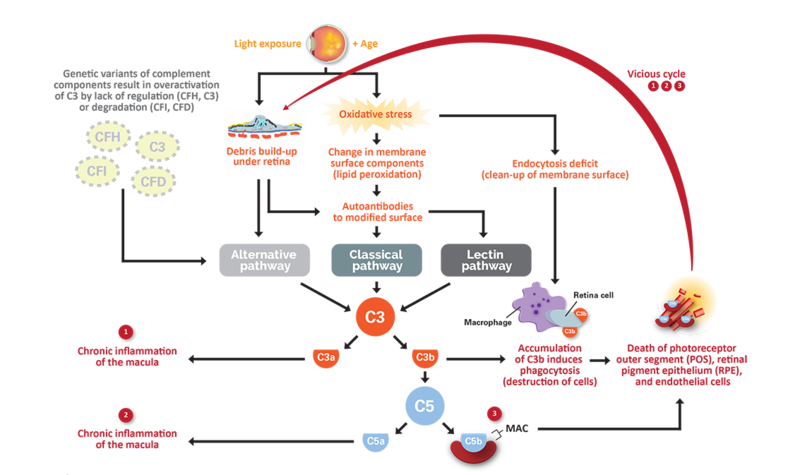 The pathophysiology of geographic atrophy secondary to age-related macular degeneration and the complement pathway as a therapeutic target. Retina. 2017;37(5):819-835. Ehmann DS, Regillo CD. Complement inhibition for treatment of GA. Rev Ophthalmol. 2016;23(6):69-72. Fritsche LG, Chen W, Schu M, et al. Seven new loci associated with age-related macular degeneration. Nat Genet. 2013;45(4):433-439, 439e431-432. Joseph K, Kulik L, Coughlin B, et al. Oxidative stress sensitizes retinal pigmented epithelial (RPE) cells to complement-mediated injury in a natural antibody-, lectin pathway-, and phospholipid epitope-dependent manner. J Biol Chem. 2013;288(18):12753-12765. Katschke KJ, Jr, Xi H, Cox C, et al. Classical and alternative complement activation on photoreceptor outer segments drives monocyte-dependent retinal atrophy. Sci Rep. 2018;8(1):7348. Vaz F, Picoto M. Geographic atrophy. AMD Book Web site. http://amdbook.org/content/geographic-atrophy-0 Accessed May 7, 2018. Apellis protocol no. APL2-303. A phase III, multi-center, randomized, double-masked, sham-controlled study to compare the efficacy and safety of intravitreal APL-2 therapy with sham injections in patients with geographic atrophy (GA) secondary to age-related macular degeneration (AMD) [DERBY v3.0], March 19, 2018. Apellis Pharmaceuticals. Apellis protocol no. APL2-304. Phase III, multi-center, randomized, double-masked, sham-controlled study to compare the efficacy and safety of intravitreal APL-2 therapy with sham injections in patients with geographic atrophy (GA) secondaryto age-related macular degeneration (AMD) [OAK v3.0], March 19, 2018. Apellis Pharmaceuticals. Hazel CA, Petre KL, Armstrong RA, et al. Visual function and subjective quality of life compared in subjects with acquired macular disease. Invest Ophthalmol Vis Sci. 2000;41(6):1309-1315. Wang W, Gawlik K, Lopez J, et al. Genetic and environmental factors strongly influence risk, severity and progression of age-related macular degeneration. Signal Transduct Target Ther. 2016;1:16016.